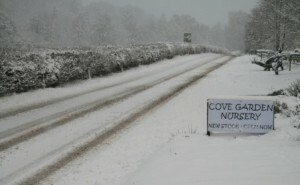 Well the last few days have been Spring like here in Cove and we have all been feeling very positive! Nothing like the sun to get you out into the garden, and discover what has survived the frost and beginning to shoot up. 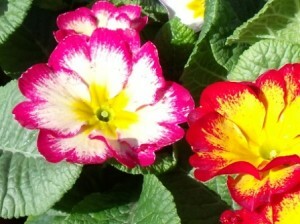 If you need a bit of instant colour and can’t wait we have some lovely primroses in an array or colours! 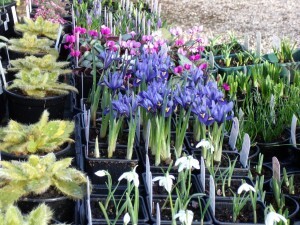 We also have a selection of iris and crocus as seen in the photos below. 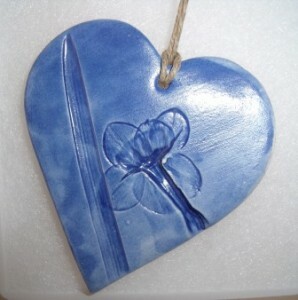 We are also now selling lovely ceramic hearts made by Devon artist Nicky Harland who presses fresh flowers into the clay to make a print. 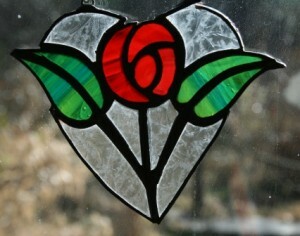 Very pretty and ideal for Mothers Day! 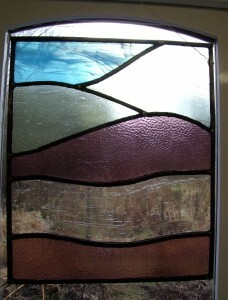 I have recently finished a private commission with the brief of ’do whatever you like’ so I designed this simple piece inspired by the rolling hills of Devon I can see from my window which I had been thinking of recreating in glass for a while. I actually used all lead instead of copper foil this time seeing as it is quite big, something I haven’t done for a while. If anyone would like something similar get in touch!! And finally if anyone has been wondering about Jack Cat here he is fully exploring his territory at last now he is able to go outside. 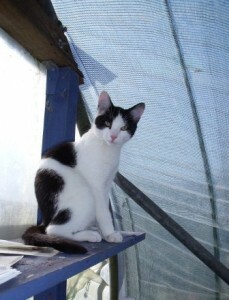 He is proving to be a very useful member of staff as he has already caught 3 mice (possibly blind!). Alpine Colour, New Perennials & Much More…..
New this week is a range of Dartmoor grown Alpines including some pot grown spring bulbs. These would add a bit of colour to rockeries, containers or well drained borders. With the sun shining this week, these hardy plants would definitely enhance gardens awakening from a long cold winter rest. Also new this week we have a selection of perennials, many in 9cm pots so they’re not going to break the bank and offer great value for preparing colorful borders for sun or shade. These include for sun Rudbeckia ‘Goldstrum’ with its golden ‘daisies’ a must for late summer displays, Aubretia – a must for sunny spots where it can be allowed to flow over walls or to soften the edge of paths, Euphorbia a. Purpurea offers strong evergreen (or should that be ever purple) foliage contrasts well with golden plants. Spring gems Native Primroses & Cowslips have also arrived. These nursery grown plants have buds or flowers for instant appeal. For shade we now have leathery evergreen Bergenia ‘Rotblum’ also with reddish-pink flowers good for under-planting around shrubs and under trees. Alchemilla mollis better known as ‘Ladies Mantle’ makes a mound of grey-green ruffled foliage with lime green flowers to complete the picture. The Geranium phaeum ‘Album’ is a strong growing variety that does well under trees and in shadier parts of the garden. 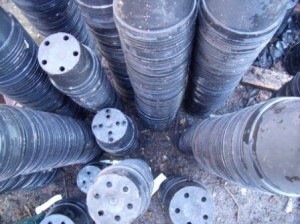 As well as the new intake of ready to buy plants, we have started potting some of our own stock. The first was a batch of Hostas including favourites such as ‘Sum & Substance’ & ‘Francis Williams’. These should be ready for sale this summer. Just arrived today are the first of the Zonal Geraniums as rooted cuttings, once potted these will form part of our range of patio and basket plants for coming season. Well its another snow day here in Devon so its time to sit in the warm and update the blog! 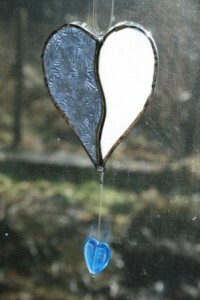 Have finally made a kingfisher, its really hard to recreate the amazing flash of blue but I think its worked quite well. He is hanging in the shop window ready for someone to take him home and enjoy! Everything you need for Valentines? Well maybe, but we have just had another delivery of stock. This time it included a great selection of ornamental & fruiting trees, soft fruit & roses. If you were planning on buying roses for valentines why buy only a dozen when you could buy the whole bush! We have a great selection of popular varieties of climbers, bush, patio roses and a selection of David Austin English Shrub Roses. We also have some superb standard roses including varieties such as ‘Champagne Moment’, ’Simply the Best’ & ‘ Tickled Pink’ would make great gifts. We now have a good selection of fruit trees. Old favourites such as Cox’s & Bramley’s Apples, pears, cherrys, apricots, plums, peaches, nectarines and quinces are among the selections. The trees we’ve had in are 2 year old stock and should stat to produce fruit soon (possibly a small crop this year!) Soft fruit includes Currants (Black, Red & White), Gooseberries, Raspberries, Rhubarb and the “super fruit” Blueberries. If you’re looking for an ornamental tree we now have a selection to suit gardens large and small. For larger gardens we have spectacular trees such as Acer ‘Crimson King’. For the smaller garden we have gems such as Malus ‘Royal Beauty’. 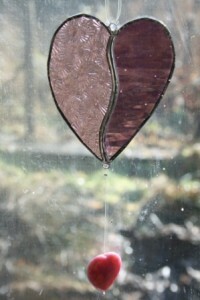 Valentines Day is only a week away so here are some new stained glass hearts for your loved one! 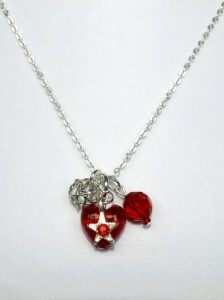 So this year instead of the usual roses and chocolates why not treat them to something that will last for ever! (Maybe you should still buy the chocolates and perhaps some bubbly just in case?!) We also have some handmade cards by Sunrise Cards to go with our expanding range of crafts. These gifts would work equally well for Mothers Day which is 14th March. Why don’t you suprise the important people in your lives with something unique instead of leaving it to the last minute and popping down the 24 hour garage!! Have just also finished this latest commission which I thought I would share with you. If you would like something similar come in and have a chat! 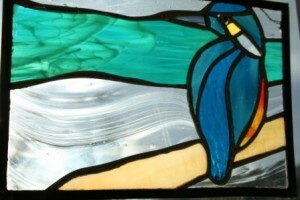 Anyone wondering what has happened to the kingfisher I have seen him daily and have finally made him in stained glass. Just waiting for some lead to arrive to frame him and will post it up for all to see and judge! We now have a range of composts including multi-purpose, gro-bags, ericaceous and manure in stock. 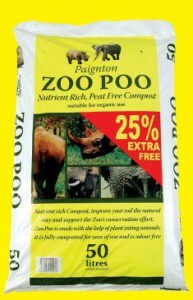 We also just received our first delivery of the very popular Zoo Poo. Made with manure collected at Paington Zoo. This is a novel way of improving your soil fertility. It’s can also be used in organic production and at £4.49 a bag it’s also great value so it is sure to stampede out of here! 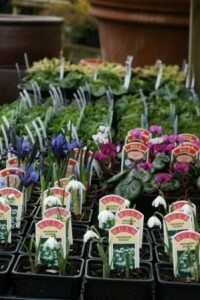 With more stock arriving next week our range of plants is ever increasing. We’re all hoping for an early Spring. We have got to the stage in the craft shop refurbishment when we are ready to put paintings up. 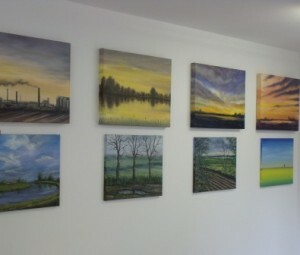 So we are very lucky to have a selection of oil paintings by Cambridge artist Ashley Baldwin Smith. With these paintings he has given us a reminder of the fens of East Anglia and captured the beautiful sunsets and never ending skys that inspired Constable and Turner. We feel very lucky that he has given us this chance to show and sell his work. He has also been inspired by the rolling hills of Devon and the beauty of Exmoor and for anyone wanting a local scene we have his ‘Storm over Exmoor’ oil painting which perfectly captures the drama and atmosphere of the breaking storm. 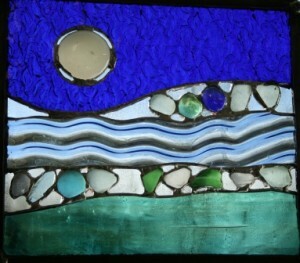 Go on to our links to click onto his site for more information and better reproductions of his work. 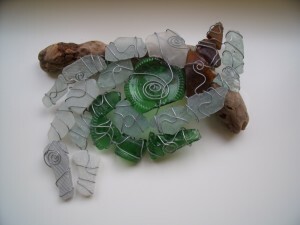 We also have some individual pottery by Hilary Butler who also makes the beautiful (Devon beach collected) sea glass sculptures and hangings as well as dicroic glass pendants. So all in all feeling that the shop is beginning to look very good (though I must admit we haven’t got the floor tiles yet!) 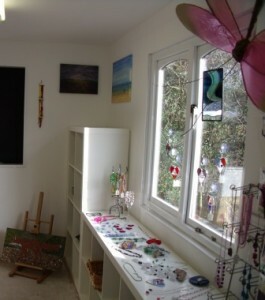 we still have some amazing jewellery for sale from Glitz’n'Glamour, Vivabeader, KMD , brooches by Lucy’s Designs and Snapdragon and also some stained glass by Helen Fonnereau..(thats me). New stock is now arriving thick and fast. We’ve just received our delivery of seed potatoes including first & second early varieties and main-crop varieties. These include the blight resistant variety ‘Accord’, popular earlies ‘Rocket & ‘Foremost’, excellent salad varieties ‘Charlotte’, ‘Pink Fir Apple’ & ‘Nicola’, popular main-crops such as ‘Desiree’, ‘Cara’ & ‘Maris Piper’ (the best variety for chips). Despite the cold weather it’s not too early to start chitting your early potatoes in a cool but frost free position. These now compliment our range of Onion & Shallot sets that arrived with our selection of Vegetable & Flower seeds from Kings seeds a few days ago. Also arrived today our order of Summer Flowering Bulbs & Tubers. We have selected an exciting range of Gladioli, Lilies, Dahlias, Begonias etc. available now for spring planting. Among these you will find the ever popular Dahlia ’Bishop of Llandaff, the bright red with gilt edged Gladioli ‘Baccara’, pure white and scented Regale Lily and the vibrantly coloured ’Frimbriata’ series of Begonias. These are sure to bring a blaze of colour to patio planters & flower borders this summer. Valentines Gifts and going Potty! Its been quiet here but that doesn’t mean we haven”t been busy. We’ve had another skip delivered, this time a mega one because we filled the last in no time at all. 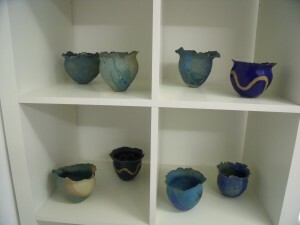 So I’ve been sorting pots..lots of them and as you can see I have been going a bit potty. I had to take a photo and I kind of like it in a random sculptural way! Paul has been busy along with our friend Mark refurbishing the craft shop. Its been plastered and painted and is starting to look very fresh. Just need to put carpet tiles down and we are done. Which leads me on to Valentines Gifts have received some beautiful necklaces from KMD who makes very delicate and beautiful jewellery, a gift for any occasion (Mothers Day coming soon too!) and UK handmade. 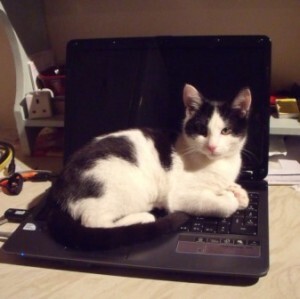 And finally by popular demand meet the newest member of the Cove team…my new lap top or should I say Jack Cat! We adopted him from the Blue Cross before Christmas and he is a very laid back cat considering all the guests we have had recently along with their dog! He is still quite young and is only going outside in small doses but managed to get stuck up a tree today! Luckily didn’t need to call the fire brigade, just Paul with a ladder! 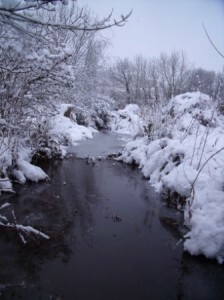 Well the snow that has been promised for ages finally arrived (about 2 weeks too late) with a vengeance last night. We measured 7 inches on the benches. We have been shovelling it off the polytunnels to minimise damage but by the look of the forecast we may have to do it again. 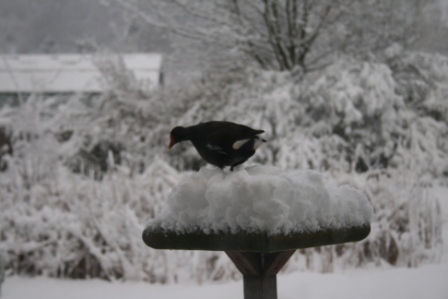 Had to shovel it off the bird table too and am more concerned about running out of food for them! Recent bird visits have been the kingfisher briefly and regularly see bull finches, nuthatch and also buzzards in the valley. It has been stunning in the snow and extremely peaceful, as I look out of the window at the birch trees I could imagine myself in Lapland. Need a deer to come pose for the camera to make our next Christmas cards! They have been shy of late but saw plenty of prints in the snow this morning. We are currently refurbishing the craft studio but are actually open for business but none but the foolish would venture out in this!